According to FJP President Samuel J. (“Buddy”) Silberman, “In their hour of crisis, they have turned to Federation for assistance”. He also pointed out that “none of [the three] institutions [was] a member agency of Federation.” This action on behalf of Federation was unprecedented because it marked “the first time in the 51-year history of Federation that a non-member agency has received a financial grant.” Nonetheless, the Board of Trustees of Federation unanimously approved the distribution of funds. 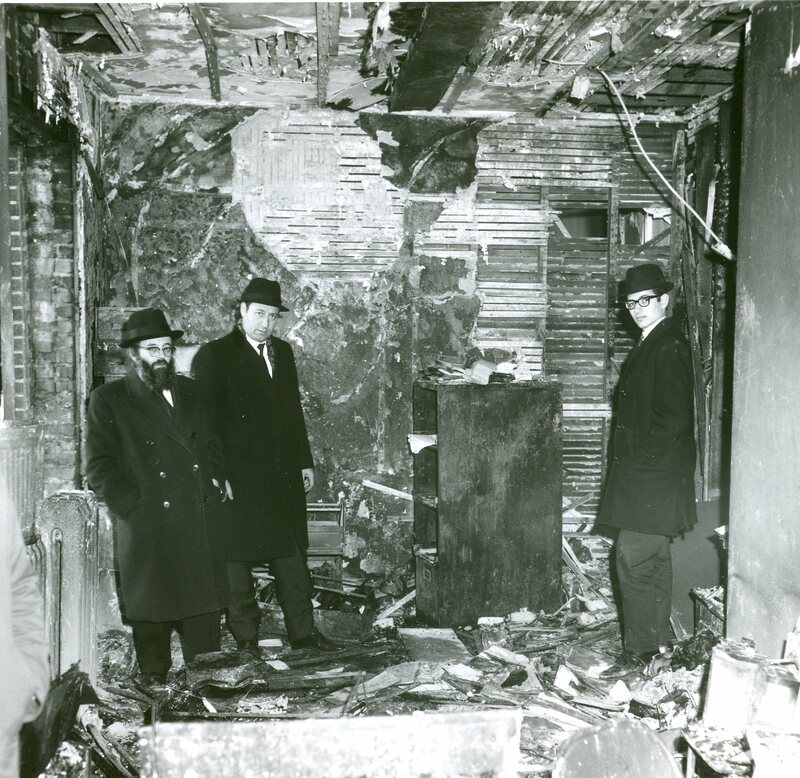 The file on the fires and grants was found in the papers of Rabbi Isaac N. Trainin, who for many decades headed the Commission on Synagogue Relations, which served as the link between Federation and the synagogue and Hebrew day school community. Rabbi Trainin’s files can be found in the Religious Affairs Department subseries. These files most likely served as a general reference resource within the agency. Whenever a person was slated to speak at a fundraising event, for example, PR staff could consult the person’s bio file to write a short introduction for them. These bio files also would have been quite useful for PR staff as they crafted press releases. The FJP PR subseries also includes some such press releases and quite a few of the newspaper clippings that resulted from them. Besides these forms, there are some general biographical files on those less directly affiliated with Federation, including some famous names. Unlike the “Biographic Information on Federation Leaders” forms, this material seems to have been culled by staff through research, rather than supplied by the individuals themselves. 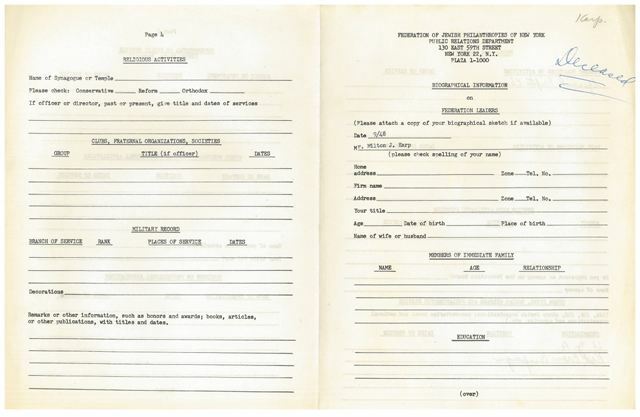 Some of the celebrities who FJP PR staff kept reference files on include: Claudette Colbert, Tallulah Bankhead, Ray Bolger, Victor Borge, Edna Ferber, Judy Garland, John Gielgud, Oscar Hammerstein, Judy Holiday, Jackie Robinson, and Margaret Sanger. 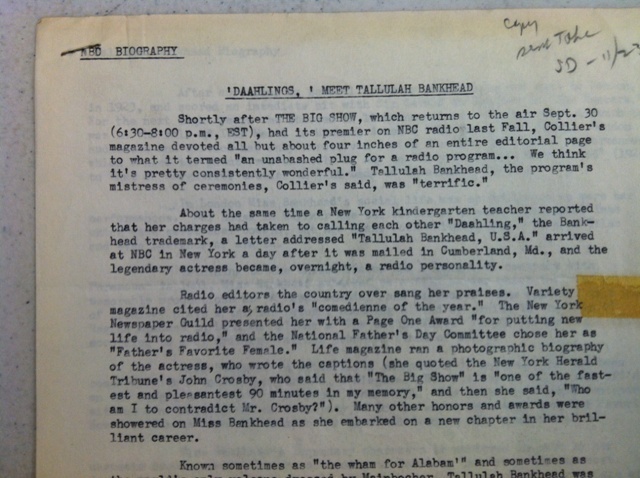 This bio sheet found in the Tallulah Bankhead file was one of the more colorful (“Daahlings”!) documents in this section. 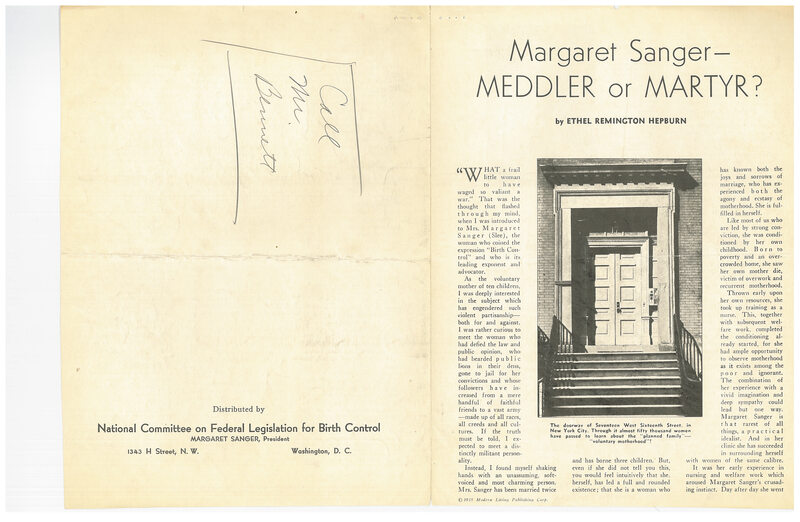 When in the course of processing the biographical files I encountered a file on Margaret Sanger (1879-1966), a nurse and activist who had been instrumental in legalizing contraception in the United States, this page of a magazine article on Sanger entitled “Margaret Sanger – Meddler or Martyr?” stopped me in my tracks. Given Federation’s role as a social services agency, reproductive rights was an issue that came up from time to time for FJP. Having information available on Sanger would have therefore proved useful again and again. Susan found evidence of this and in May 2012 wrote on this blog about how Federation dealt with the issue in relation to The Welfare and Health Council of the City of New York in 1953. If you would like more information on Margaret Sanger, many published biographies and even an autobiography are available. Just last year, a critically acclaimed graphic novel about Sanger called Woman Rebel came out. The National Archives has a “Teachable Text” webpage on Sanger that draws upon some Sanger documents held in the NARA New York office. 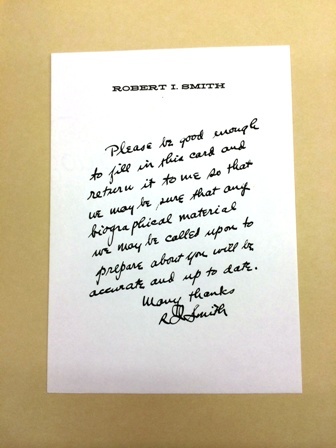 It is only 15 years since Bob Smith wrote this note to Rabbi Trainin, but we archivists do feel sometimes like anthropologists, or perhaps archeologists, digging up the bones. Bob was wrong, however, that only recollections remain. The story of the negotiations and difficulties that took place over the creation of a kosher kitchen at Long Island Jewish Hospital in the 1950s is well-documented both in Rabbi Trainin’s papers in the Department of Religious Affairs and in the papers of other executives and leaders at Federation also involved, particularly Joseph Willen, Executive Vice-President of Federation at the time. And it was this issue that was in part responsible for the creation of a position on the Federation staff for a Rabbi. This issue of Kashrut brought about a lot of changes in Federation’s attitude towards agencies’ attention to Jewish tradition, and Federation’s connections with synagogues and Yeshivas became more formalized under Rabbi Trainin’s leadership. Funding priorities began to shift within the next 20 years as well. No, Bob, your fight has not been forgotten. Have you a little time on your hands? 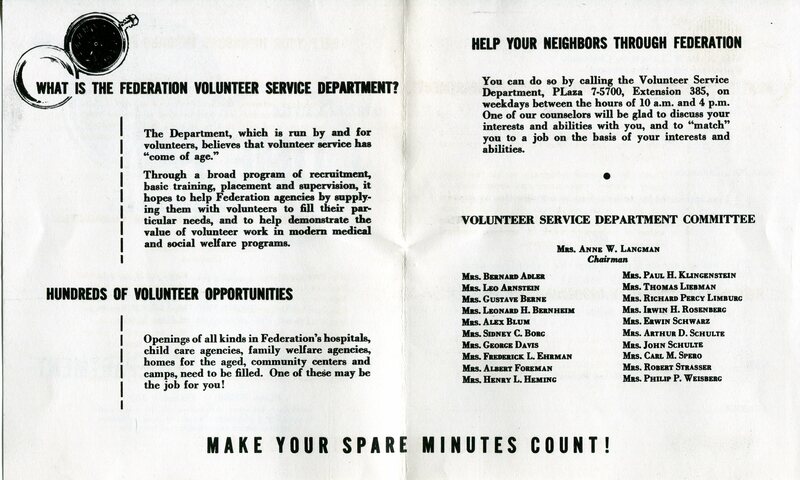 The Volunteer Services Department at Federation was run entirely by … volunteers. It is unclear how long the department existed, although at least from 1953 to 1958. It no doubt served a very important role in recruiting volunteers for various Federation Agencies. 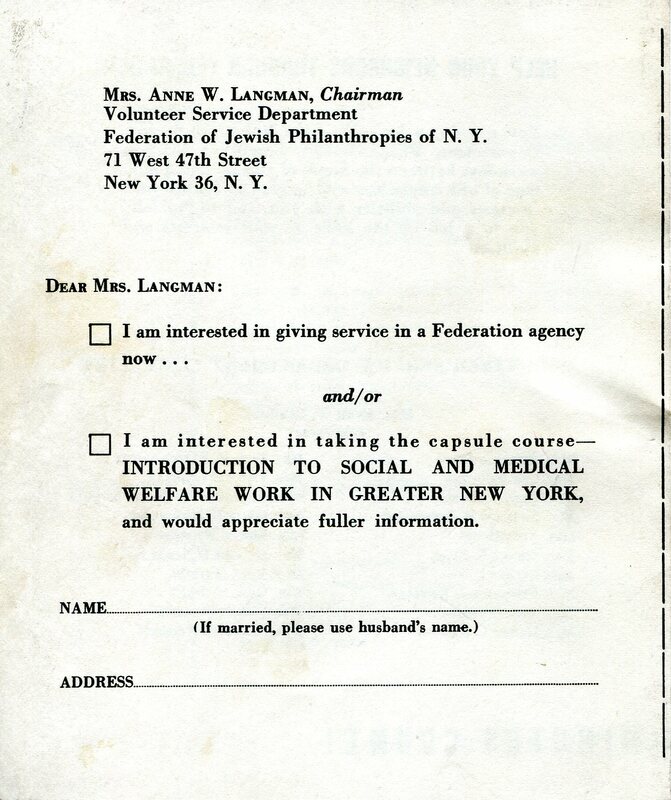 there is a sign up form; the chairman, Mrs. Anne W. Langman, specifically requests “If married, please use husband’s name”. 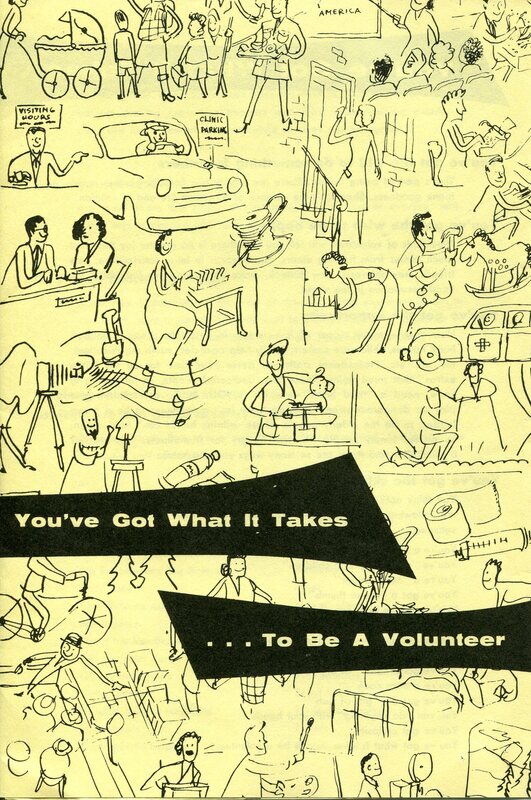 There was one other pamphlet in this folder, “You’ve Got What It Takes … To Be A Volunteer”, 1958, issued by the Joint Recruitment of Volunteers. 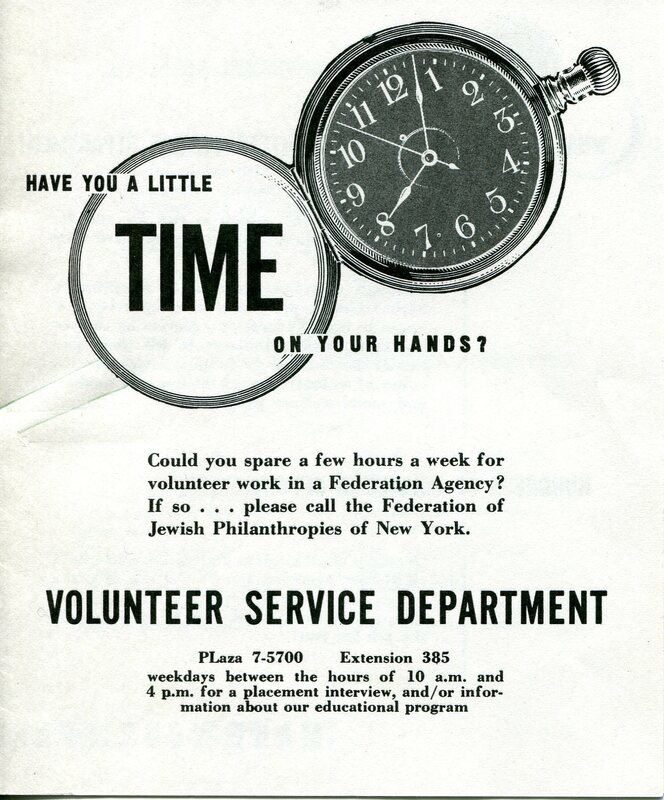 The Federation of Jewish Philanthropies was one of 8 organizations who sought volunteers through the Joint Recruitment of Volunteers. As no additional files have been found from Federation’s Volunteer Service Department, this file may be the only record of its existence to survive in the Federation archives. According to a 1953/54 pamphlet found in the budget files, the Educational Alliance was created in 1899 to “help meet the urgent needs of … immigrants”, providing “recreation, culture and education to the Lower East Side”. 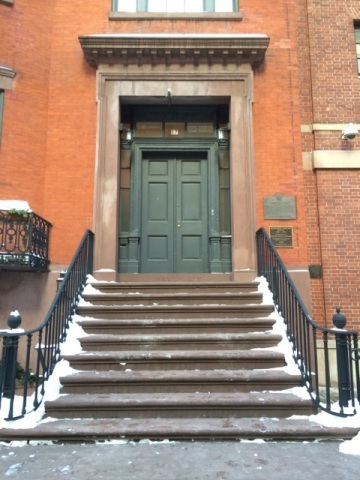 Located in the heart of the Lower East Side, the Alliance has for over 100 years provided the services most needed by the residents in the neighborhood. As new immigrants replaced those who could afford to move out of the Lower East Side to more middle class neighborhoods in New York City and to the suburbs beyond, the Alliance has adjusted its services to meet the changing needs of the community. The Educational Alliance has been an agency of Federation since the year Federation came into existence, 1917, and was funded every year through Federation’s merger in 1986. In 1911 Adolph S. Ochs, the publisher of The New York Times, began thinking about the role of a newspaper in charity and helping the needy. With his direction and encouragement the Times created the Neediest Cases Fund, held its first campaign in December 1912, and has held a campaign at the end of every year since then. What is the connection with UJA-Federation of New York? 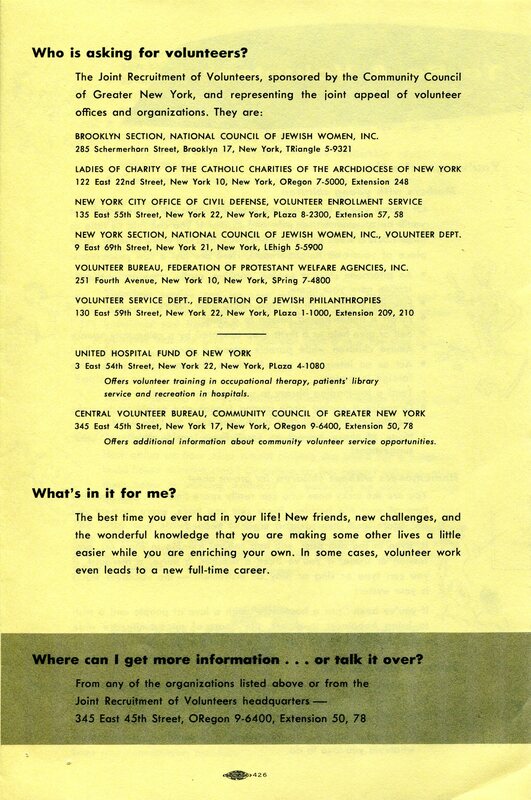 Although it is not clear from the files we have seen exactly when the relationship between the New York Times and Federation began, but Federation has for many years been one of the “established welfare agencies” receiving funds collected by The New York Times during the annual Neediest Cases Fund campaign. We do have a few files from the 1970s -1980s, from the Executive VP files and the budget files with correspondence about how to distribute Federation’s share of what was raised, which makes it clear that the relationship with Federation and the Neediest Cases Fund was one of longstanding. The Times pays all the administrative costs for the fund so that 100% of the donations go to the agencies. From the beginning, the Times’ approach was to publish true stories of people who have been helped by donations to the Fund – helped in very specific ways by one of the welfare agencies receiving donations on behalf of the Fund. Every Sunday during the fund’s annual campaign the story of a recipient is published in the Times. This week the story is of students at PS188 on the Lower East Side, whose after school activities are provided by the Educational Alliance. This year, the Alliance “withdrew $4500 from the fund to buy uniform shirts for 184 middle-school students in the program.” The story about the students and the program is here. 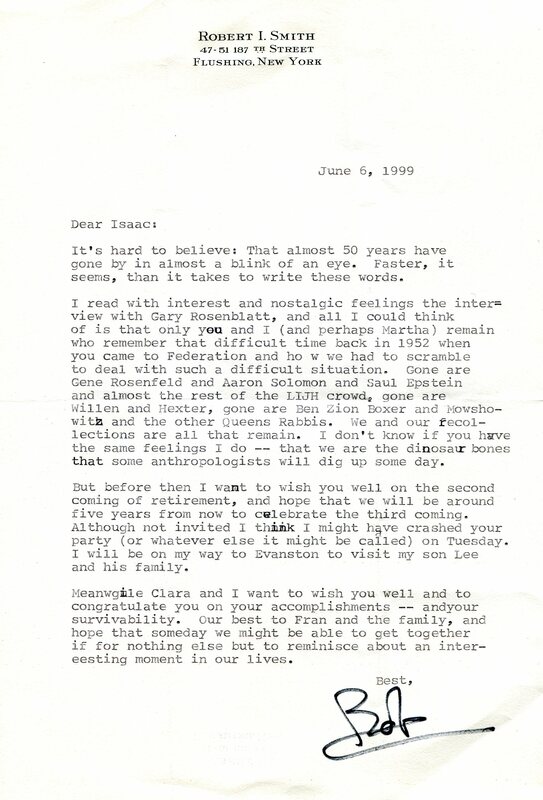 Six of the Federation oral histories include information about the Educational Alliance; these names can be searches at access.cjh.org to locate the audio files as well as the transcripts: Jacob Birnbaum, Doris Rosenberg, Ernest Rubenstein, Roslyn Sherman, Helen Popper and Martin D. Payson. AJHS also holds a small Educational Alliance collection.